by Moffett, Michael H.; Stonehill, Arthur I.; Eiteman, David K.
Fundamentals of Multinational Finance helps prepare tomorrow’s business leaders to comprehend global markets and lead organizations through a constantly changing global environment. Via illuminating case studies and real¿-world examples, readers are introduced to the fundamental concepts and tools necessary to implement an effective global financial management strategy. The 6th Edition reflects the juxtaposed forces of an increasingly digital global marketplace and a resurgence of nationalist culture and identity. Financial forces, markets, and management are in many ways at the crux of this challenge. This edition reflects a business world trying to find a new balance between business startups like the micro-multinational, a maturing China, a separatist Britain (Brexit), and an attempt by governments globally to channel, regulate (and tax) multinational firms that continue to grow in stature and strength. Michael H. Moffett is Continental Grain Professor in Finance at the Thunderbird School of Global Management, where he has been since 1994. He has also held teaching or research appointments at Oregon State University (1985-1993), the University of Michigan, Ann Arbor (1991- 1993), the Brookings Institution, Washington, DC, the University of Hawaii at Manoa, the Aarhus School of Business (Denmark), the Helsinki School of Economics and Business Administration (Finland), the International Centre for Public Enterprises (Yugoslavia), and the University of Colorado, Boulder. Moffett received a BA (Economics) from the University of Texas at Austin (1977), an MS (Resource Economics) from Colorado State University (1979), an MA (Economics) from the University of Colorado, Boulder (1983), and a PhD (Economics) from the University of Colorado, Boulder (1985). He has authored, co-authored, or contributed to a number of books, articles, and other publications. 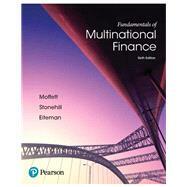 He has coauthored two books with Art Stonehill and David Eiteman, Multinational Business Finance, and this book, Fundamentals of Multinational Finance. His articles have appeared in the Journal of Financial and Quantitative Analysis, Journal of Applied Corporate Finance, Journal of International Money and Finance, Journal of International Financial Management and Accounting, Contemporary Policy Issues, Brookings Discussion Papers in International Economics, and others. He has contributed to a number of collected works including the Handbook of Modern Finance, the International Accounting and Finance Handbook, and the Encyclopedia of International Business. He is also co-author of a number of books in multinational business with Michael Czinkota and Ilkka Ronkainen, International Business (7th edition) and Global Business (4th edition). Professor Moffett has also published extensively in the oil and gas industry including The Global Oil and Gas Industry: Strategy, Finance, and Management, with Andrew Inkpen, Managing Human Resources in the Oil & Gas Industry, with Steve Werner and Andrew Inkpen, and The Global Oil and Gas Industry: Case Studies From The Field, with Andrew Inkpen and Kannan Ramaswamy. Arthur I. Stonehill is a Professor of Finance and International Business, Emeritus, at Oregon State University, where he taught for 24 years (1966-1990). During 1991-1997 he held a split appointment at the University of Hawaii at Manoa and Copenhagen Business School. From 1997 to 2001 he continued as a Visiting Professor at the University of Hawaii at Manoa He has also held teaching or research appointments at the University of California, Berkeley, Cranfield School of Management (UK), and the North European Management Institute (Norway). He was a former president of the Academy of International Business, and was a western director of the Financial Management Association. Stonehill received a BA (History) from Yale University (1953), an MBA from Harvard Business School (1957), and a PhD in Business Administration from the University of California, Berkeley (1965). He was awarded honorary doctorates from the Aarhus School of Business (Denmark, 1989), the Copenhagen Business School (Denmark, 1992), and Lund University (Sweden, 1998). He has authored or co-authored 9 books and twenty-five other publications. His articles have appeared in Financial Management, Journal of International Business Studies, California Management Review, Journal of Financial and Quantitative Analysis, Journal of International Financial Management and Accounting, International Business Review, European Management Journal, The Investment Analyst (UK), Nationaløkonomisk Tidskrift (Denmark), Sosialøkonomen (Norway), Journal of Financial Education, and others. David K. Eiteman is Professor Emeritus of Finance at the John E. Anderson Graduate School of Management at UCLA. He has also held teaching or research appointments at the Hong Kong University of Science & Technology, Showa Academy of Music (Japan), the National University of Singapore, Dalian University (China), the Helsinki School of Economics and Business Administration (Finland), University of Hawaii at Manoa, University of Bradford (UK), Cranfield School of Management (UK), and IDEA (Argentina). He is a former president of the International Trade and Finance Association, Society for Economics and Management in China, and Western Finance Association. Eiteman received a BBA (Business Administration) from the University of Michigan, Ann Arbor (1952), an MA (Economics) from the University of California, Berkeley (1956), and a PhD (Finance) from Northwestern University (1959). He has authored or co-authored 4 books and twenty-nine other publications. His articles have appeared in The Journal of Finance, The International Trade Journal, Financial Analysts Journal, Journal of World Business, Management International, Business Horizons, MSU Business Topics, Public Utilities Fortnightly, and others.